Our Costs & Convenience | ATM Termite Control, Serving South Florida for Over 55 Years!!! How Much Do Your Termite Services Cost? New Lower Prices - We're Here to Help! A.T.M understands the current economy and we are here to help the community. We have over 55 years combined experience! Please call us or fill out a "Request an Appointment" and we would be mroe than happy to tell you about our savings plan over the phone or in-person. Here at A.T.M, we have over 55 Years of combined experience. Alternative Termite Management offers a variety of alternative methods for termite and pest control. Florida state-certified. Contact us today and let us take care of your home or business! How Much Does Your Termite Treatment Services Cost? 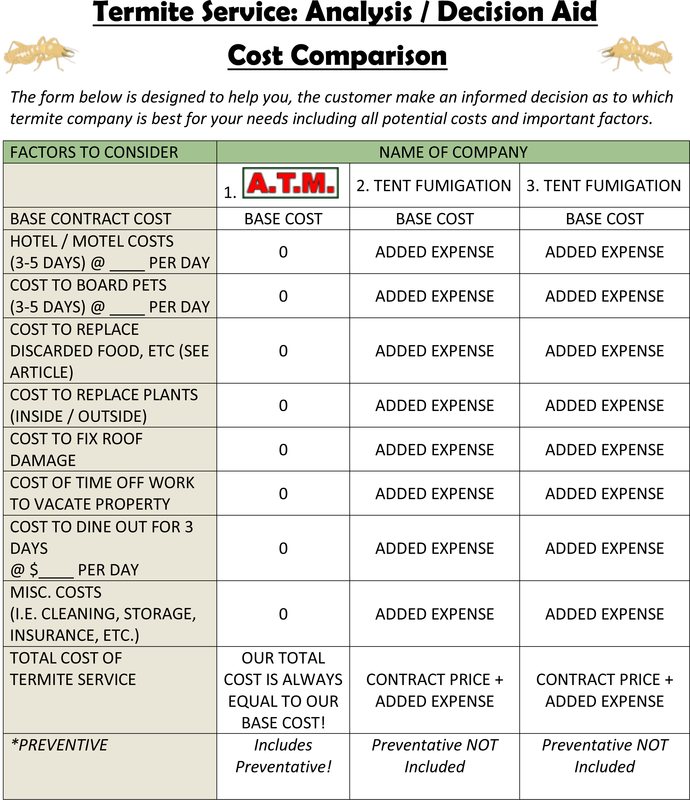 The cost of an A.T.M treatment varies and largely depends on your particular situation and the treatment plan you and your termite pest control company agree upon. In the long run, an A.T.M treatment plan generally will save you money by not having to call company after company, we aim to solve your problem the first time out. © Copyright ATM Termite Management, a Florida Termite Control Company, serving Broward, Miami-Dade & Palm Beach Counties.